Whenever you are in the market for shaggy rugs for sale, we encourage you to check out our shaggy rug sale. When you go through the cheap shaggy rugs in our inventory of more than 6,000 rugs online, you are sure to find more than one shaggy area rug that appeals to you. 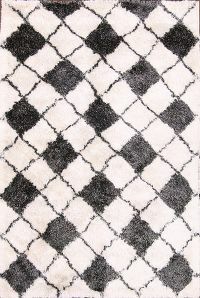 In fact, we are confident you will come across quite a few shaggy rugs you will want to have in your home or business. While some people associate shaggy rugs with 1960s Americana, the truth is these rugs have been popular choices for home and business owners and interior designers for decades. Shaggy rugs are enduring classics for a variety of reasons, including their durability and versatility. Given their long-lasting nature, shaggy rugs are perfect for high-traffic areas and homes that have kids, pets or both. 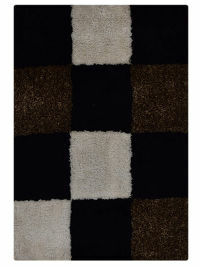 Because of their luscious feel, shaggy rugs are also suitable for bedrooms and even bathrooms. Shaggy rugs are available in many shapes and sizes, which makes it easy for them to be incorporated into just about any room’s aesthetic. As you look over our selection of shaggy rugs, you will see our inventory includes shaggy rugs in a wide array of colors, which only adds to their versatility. Shaggy rugs are made in one of two ways: They are either hand-knotted or hand-tufted. When a shaggy rug is hand-knotted, a skilled craftsperson will hand-tie many knots per square inch to make the rug. The more knots a rug has per square inch, the denser its rug pile will be. To make a hand-tufted shaggy rug, a rug-maker will use a handheld tool to punch yarn through a canvas that is stretched over a frame. After all the yarn has been punched through the canvas, fabric or latex is glued on the back of the completed canvas and fringe is added to the rug. Hand-knotted rugs can last many years when they are properly cared for. Like hand-tufted rugs, hand-knotted rugs are beautifully constructed and can be handed down from generation to generation. Shaggy rugs are made with a variety of materials, both natural and synthetic. You will often see shaggy rugs made with wool, cotton, bamboo and even leather. Some of the synthetic materials that are used to make shaggy rugs include nylon, acrylic and polypropylene. Long shag is similar to the shaggy rugs that were all the rage back in the 1960s. Short shag rugs are produced in the same manner as long shag rugs, but the fibers used to make them are only half as long as those used to construct a long shag rug. A mini shag rug has pile that is just like the pile you will find on a conventional rug. You obviously have many choices to make if you are looking for shaggy rugs for sale. From choosing the type of shag, the method of construction and the color, size and shape of a rug, it is easy to get overwhelmed when you are picking a shaggy area rug. There is no reason to feel that way though, because the sales team at Rug Source is ready to help you. Give us a call or contact us online and we will help you find the shaggy rug that will add that extra layer of comfort, color and style you want your home or office to have.